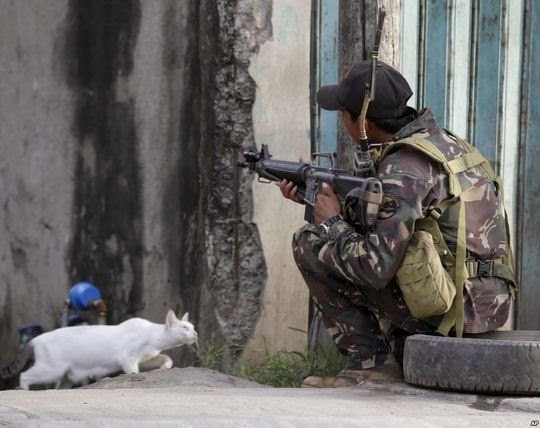 Traveling cat approaching a soldier in Zamboanga, Philippines, where troops are fighting the Muslim rebels of Moro National Liberation Front (MNLF). 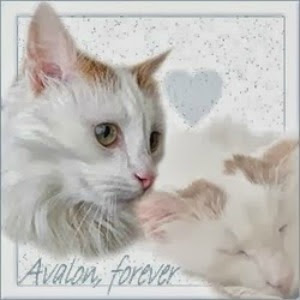 I've always loved white cats; I use to own one named Snowball (male). Oh my that is one brave kitty.Have a fabulous Friday. I love your photos and am looking forward to seeing what you share in April. Great theme. poor cat, she looks like she has babies too! What beautiful photos! I look forward to seeing where the cats take you each day next month! Ooh! I am gonna love this combination of two of my greatest passions :) Looking forward to April 1st. Love that picture, looks like the cat is going to attack the soldier. Maybe he's fed up with fighting. Poor little kitty, looks like she's plenty of litters of kittens and where did her tail go? 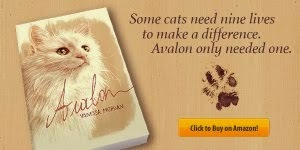 I have read about cats having a bit of a rough time in the Philippines. Totalement incroyable cette photo. La blancheur et l'innocence du chat et ce soldat en arme. Your theme will be awesome! That looks like a brave cat! Oh this is going to be a very fun blog to visit, I'm sure. That sounds like fun! Though we definitely need a woman soldier and a cat, not just guy soldiers. I wonder if he put down his gun to give the cat a pat? That cat looks stealthy indeed! I LOVE that photo! That is a great one!! I am participating in that challenge in April as well. i think it will be loads of fun! Wow, that's quite the picture! Your challenge is going to be so interesting, I look forward to seeing all your posts and pictures! We hope that cat runs the other way! The best that can happen to a cat in a war zone it that it doesn't get eaten. War is hell on people and other living things. I hope that cat doesnt get shot or hurt in any way! She looks plump, I think she might be pregnant. Run kitty run! War zone is no place for you! ❀Stay safe kitty❀Happiness is Siamese! Poor little kitty! I hope he gave her some loving! Oh my goodness - this kitty makes me nervous! Cette photo m'impressionne ... elle me fait un peu peur ... Le contraste est très fort. I know Zamboanga. I'm from the Philippines. It's scary there because of wars. Such bootiful city... That cat looks ready for an attack.